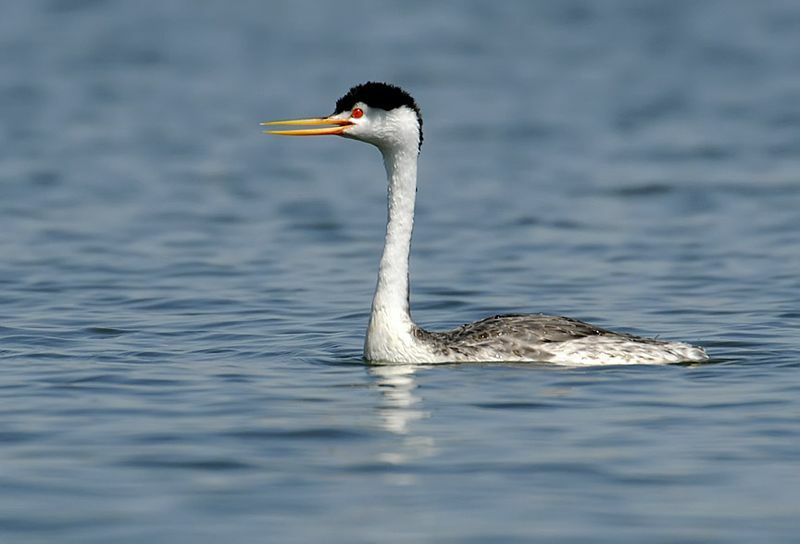 I'm lucky to have the chance to see both Western & Clark's Grebes locally throughout the summer and into fall. A particularly well-known spot to study both Aechmophorus species, sometimes side-by-side, is at Union Reservoir on the east side of Longmont, Colorado. But the lake's attraction to these large grebes comes with a trade-off: They often loiter near the middle of the mile+ wide lake. Even with a top scope the views aren't great, and with any kind of air distortion they can't be ID'd to species, much less satisfactorily photographed. The grebes didn't panic at my approach but also didn't hang around, managing to get farther away on each dive and eventually leaving me in a bird-free halo with a radius of at least 100 meters if I lazed in one spot. So I settled on a technique of paddling gently towards promising groups, snapping shots when they were close or passing by, and then moving on to the next group to avoid harrying any particular birds more than once. 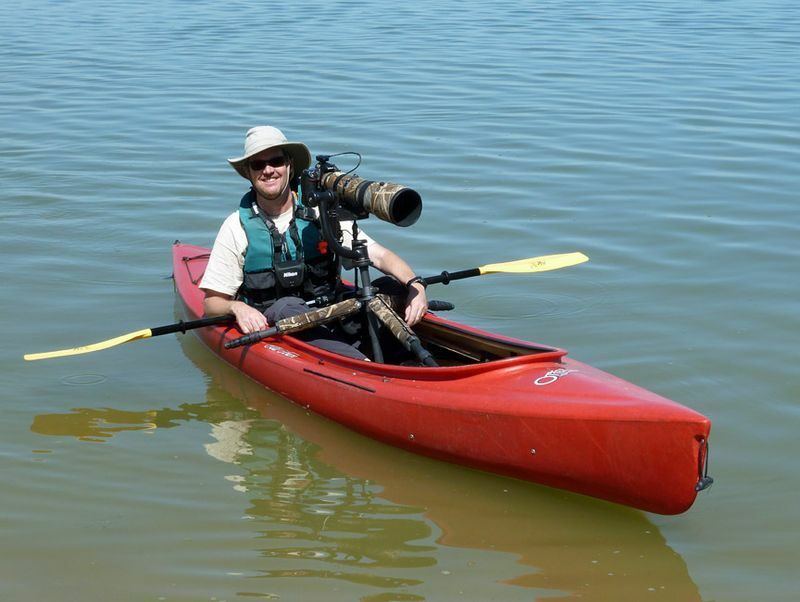 I hope you enjoy the fruits of my little private pelagic outing amongst the grebes! 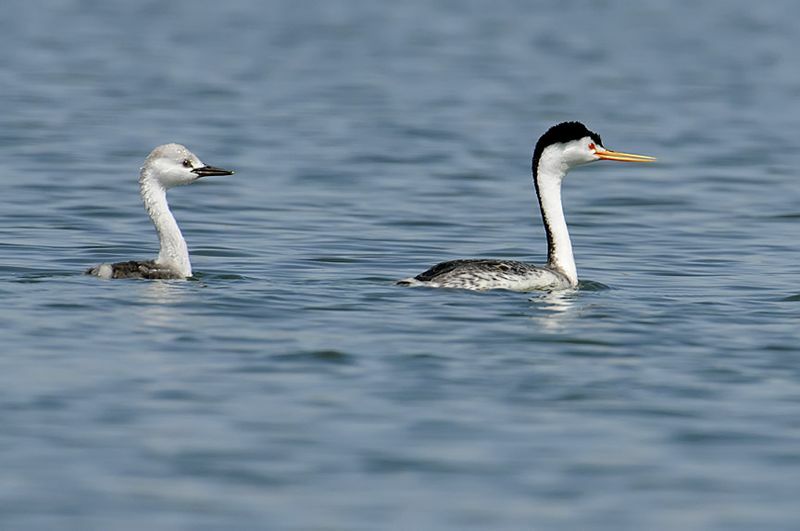 Adult Clark's Grebe (left) & Western Grebe (right), Union Reservoir, Weld County, Colorado. 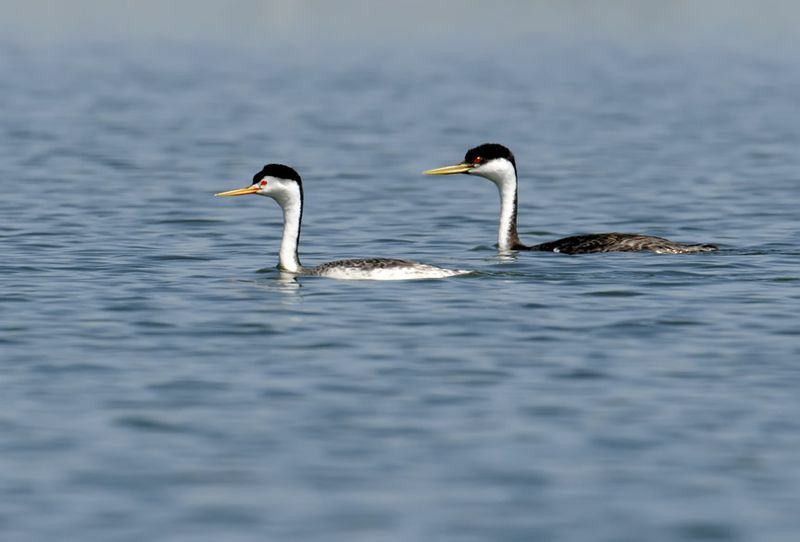 In this side-by-side comparison, note that in Clark's Grebe the eye is isolated in an all-white face, the bill is brighter yellow, and the flanks paler than in Western Grebe. Western Grebe parents working hard to fledge two juveniles before the winter freeze. 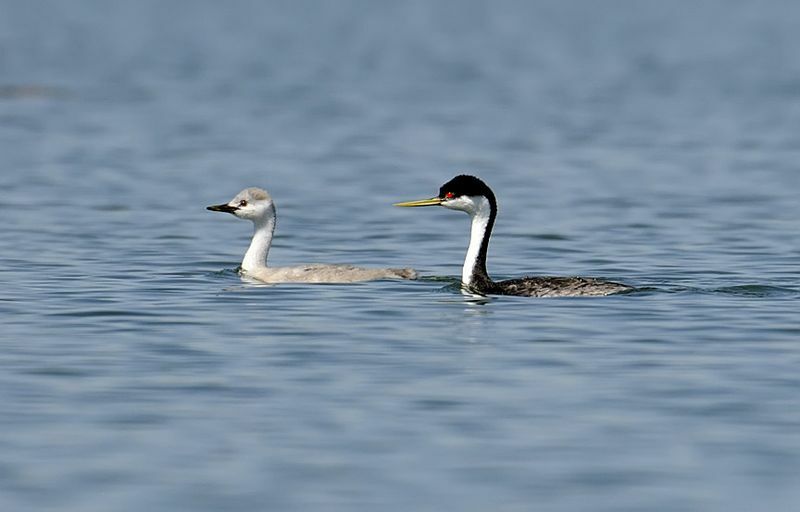 It still astonishes me how late these birds pull off breeding but every year, well into fall, many small begging gray grebes can be seen with their parents. Adult & juv. 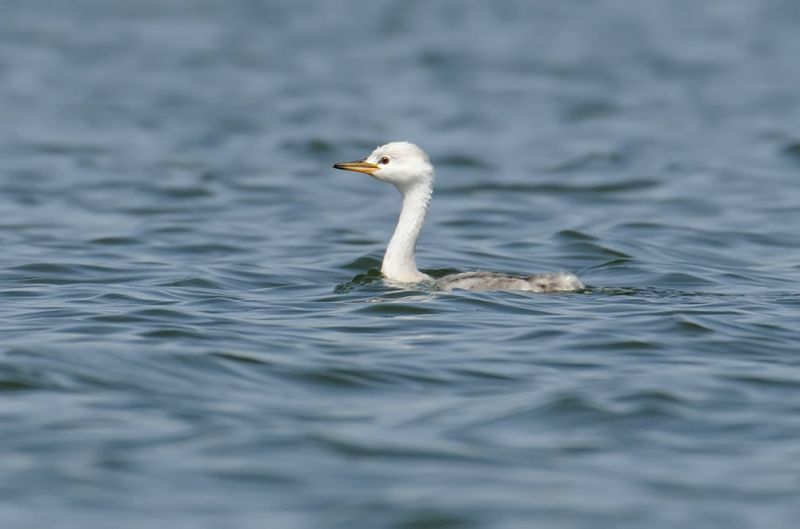 Western Grebe. I think this is a juv. Clark's Grebe but I didn't stick around long enough to confirm parentage! Adult & juv. 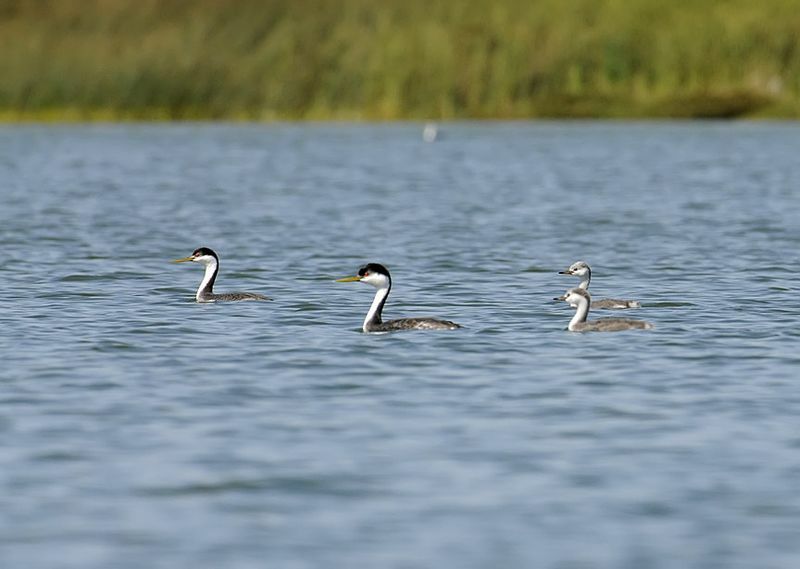 Clark's Grebes. Vocalizing adult Clark's Grebe. It was pretty amazing to be surrounded by constantly calling Western & Clark's Grebes & noisy begging youngsters!